This post aims to illustrate how to solve Scramble With Friends/Boggle and the techniques and data structures necessary. In particular, we will see how to prune an enormous search space, how to use recursion to simplify the task, and the relative performance of three different data structures: an unsorted list, a sorted list with binary search, and a trie. Given an N x N board, (4×4 in case of Boggle and Scramble with Friends), find all of the paths through the board which create a valid word. These paths must use each tile at most once and be contiguous; tile N must be adjacent to tile N – 1 in any of 8 directions (North, Northeast, East, Southeast, South, Southwest, West, Northwest). In this example, ANT is a valid solution in the bottom left corner, but NURSE is not because the Ns are not located next to the U.
must not repeat any tiles. This will work, but it suffers from an incredible flaw. Do you see it? The problem is that this method will waste an inordinate amount of time exhaustively searching the board for solutions even when the current path is completely useless. It will continue to search for words starting with QuR, QuRE, etc., etc., even though no words in the English language start with these letters. The algorithm is still correct, but it can be optimized very simply. Those with some algorithms background might recognize the code above as a modified form of a depth first search. As described previously, a depth first search will exhaustively explore every possible path through the board. We can vastly improve the efficiency of this algorithm by quitting the search early when we know it won’t be fruitful. If we know all of the valid words, we can quit when we know that no word starts with the current string. Thus in the previous example, if the current word built up so far were “QuR”, the algorithm could determine that no words start with QuR and thus fail fast and early. This optimization will not affect the correctness of the algorithm because none of the potential paths we eliminate could possibly lead to a valid word; by constraint #1 this means that none of those paths would have ended up in the list of solutions in the first place. How much does this save? On random 3×3 boards, The fastest implementation I have is sped up by a factor of 75. Solving 4×4 boards without pruning is infeasible. """Returns iterable of FoundWord objects. # This is a valid, complete words. # is not affected by this recursive call. The data structure and algorithms used to implement the IsWord and HasPrefix methods are incredibly important. An unsorted list is a terrible data structure to use for this task. Why? Because it leads to running time proportional to the number of elements in the word list. While this is easy to understand and reason about, it is extremely slow, especially for a large dictionary (I used approximately 200k words for testing). (This time is with the pruning turned on). Since we know the valid words ahead of time, we can take advantage of this fact and sort the list. With a sorted list, we can perform a binary search and cut our running time from O(n) to O(log n). Writing a binary search from scratch is very error prone; in his classic work Programming Pearls, Jon Bently claims that fewer than 10% of programmers can implement it correctly. (See blog post for more). Running the same gauntlet of tests, we see that this data structure performs far better than the naive, unsorted list approach. The final data structure I want to illustrate is that of the trie. The Wikipedia article has a lot of great information about it. 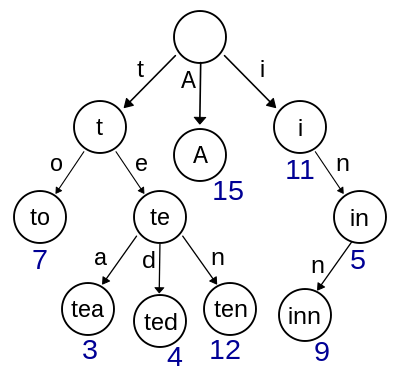 In computer science, a trie, or prefix tree, is an ordered tree data structure that is used to store an associative array where the keys are usually strings. Unlike a binary search tree, no node in the tree stores the key associated with that node; instead, its position in the tree defines the key with which it is associated. All the descendants of a node have a common prefix of the string associated with that node, and the root is associated with the empty string. Values are normally not associated with every node, only with leaves and some inner nodes that correspond to keys of interest. Again, I don’t want to reinvent what’s already been done before, so I will be using Jeethu Rao’s implementation of a trie in Python rather than rolling my own. The find_full_match is where the problem lies. This makes sense, ‘f’ doesn’t start any words in the trie containing just the word ‘hello’, so the root is returned with the ‘f’ string that doesn’t match. find_full_match correctly handles this case, since r = ‘f’, not r = False, and the fallback is returned. That fallback is used by contains to signify that the given string is not in the trie. The problem is when the string in question starts a valid string but is itself not contained in the trie. As we saw previously, ‘h’ is considered to be in the trie. # 0 evaluates to False which screws up trie lookups; ensure value is 'truthy'. Unfortunately, this is slow. How slow? While this isn’t as bad as the unsorted list, it’s still orders of magnitudes slower than the binary search implementation. Why is this slow? Well, it’s doing a whole lot of unnecessary work. For instance, if we want to determine if ‘h’ is a valid prefix, this implementation will first construct the list of all words that start with h, only to have all that work thrown away when we see that the list is not empty. A much more efficient approach is to cheat a little and use the previously discussed method _find_prefix_match which returns the node in the tree that the search stopped at and how much of the search string was unmatched. It is still slower, but not nearly as bad as before. The results appear after the conclusion. I have presented both pseudocode and Python implementations of an algorithm for solving the classic Boggle/Scramble With Friends game. In the process, we saw such concepts as recursion, depth first search, optimizing code through pruning unfruitful search branches, and the importance of using the right data structure. This post does not aim to be exhaustive; I hope I have piqued your interest for learning more about tries and other lesser known data structures. For results, the patched trie implementation, and the driver program, see below. To run the driver program, pass it a path to a list of valid words, one per line. e.g. Dictionaries are the fundamental data structure in Python, and a key tool in any Python programmer’s arsenal. They allow O(1) lookup speed, and have been heavily optimized for memory overhead and lookup speed efficiency. Today I”m going to show you three ways of constructing a Python dictionary, as well as some additional tips and tricks. This form of creating a dictionary is good for when you have a dynamic rather than static list of elements.